Hello! It's time for a new Mojo Monday sketch (#187).. I hope you will join us! By the time this posts, we will be getting ready to head to the children's hospital.. My DD, Sabrina, is having some surgery on her both of her big toes this morning.. :( Wish her (and us luck)! I have no idea what this week (or the coming weeks for that matter) will be like, but I do have a few posts scheduled for this week.. I will try to get around and visit blogs when we are back home and things have calmed down a bit.. As always, I appreciate your visits and sweet comments! With Easter being so late this year (at least it seems late to me), I thought I'd try to get a few Easter cards made. I used Verve's Egg-stra Special today. I stamped the little chick in the egg, colored and paper-pieced, then I cut out the image. The chick is popped onto the Embossed Oval Die and both of those are popped on to the Classy Label Die. I colored some seam binding with a Copic marker and added some yummy twine from my last Verve order (Julee's packages are almost too pretty to open!).. I stamped my sentiment on the largest die in the Charming Oval Die Set and made it into a tag. Accessories: Embossed Oval Die, Classy Label Die, Charming Oval Die Set (Verve); Medium Scallop Die (Papertrey Ink), Swiss Dots embossing folder (Provo Craft), Markers (Copic), Seam binding, Button, Twine, Foam tape, Thread, Sewing machine. Such a sweet card! Best of luck to your daughter. Awe... this is so sweet and cute. I love the vibrant colors of this lovely Eatser card. I hope eveything went well with the surgery and your daughter will recover soon. Take care! I will be thinking of your DD and your family and sending speedy recovery thoughts your way! This is such a cute card! Can you please tell me how you sew on your paper...I tried to do this for the first time yesterday and it did not work for me at all :( TFS! I said a little prayer for sweet Sabrina last night :) Your card is so darn cuuute! Love the little chick and bright colors! Thanks for the inspiration! What a FABBY card Stephanie! I love the cute chick (complete with the paper pieced egg). Such a beautiful creation!!! I sure hope your sweet little girl is doing well. Sounds like you will be a busy momma for a while. This is such a happy easter card. Love the bright colors and the adorable chick. So sorry to hear you are off for surgery. Lots of hugs and prayers to you all. Such a sweet Easter card - love the cute chick and papers! Hope all went well with your DD's surgery! 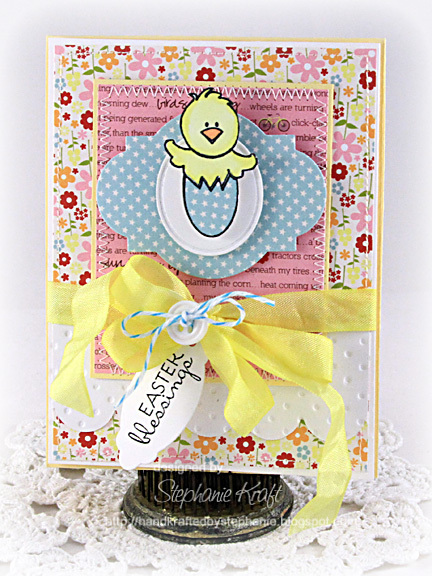 Stephanie, LOVE your CUTE Easter card! Also thx for sharing about your dear daughter. She'll be in my prayers. Please let us know how she's doing!